Angelica 3-Light pendant features a clear glass shade and vintage style starter bulbs. A sparkling cut crystal “necklace” gives the Angelica collection its signature look – helping bring sophistication and attention-getting style to hallways, baths, kitchens and more. 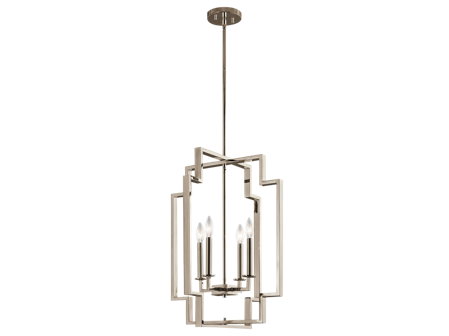 Inspired by the geometric lines found in contemporary furniture, This Downtown Deco large 4 light foyer pendant brings a soft dose of updated style to a room. The squared edges of the outer frames surround the curved candles, allowing the light to fully shine through. This fixture features a stunning combination of rustic, time-worn finishes like Distressed White Wood on the cascading beads, vintage-inspired French Washed Oak finish on the frame and candle tubes, and Weathered Iron on the chain. Together these elements create a warm, and elegantly simple update to the traditional style of this classic light fixture. The simple silhouette of the Beverly chandelier make it versatile enough to fit in a wide range of décor. 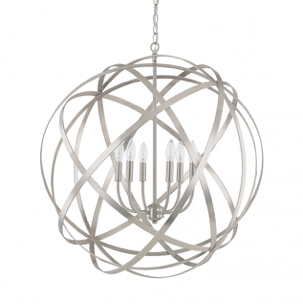 Soft outer shades give this 5 light chandelier from the Saldana collection a glowing Celestial feel. When lit, the white translucent organza shades shimmer, diffusing the light from the Satin Etched Opal Glass inside. The clean, structural lines touched with a Classic Pewter finish provides the perfect foundation for this light and ethereal design. The Axis has beautiful rhythm and movement as the metal outer shade wraps around and around. With classic candelabra lamps and a sleek finish, this pendant brings an updated elegance to any room. Inspired by the Ombré trend in today’s fashion, the Tori lighting collection features a hand-dipped, dyed color gradient technique on beautiful linen fabric, through which the rich colors softly diminish into white. The Satin Nickel finish is coupled with a Grey Ombré fabric. The metal tassel at the bottom adds a more traditionally tailored look. This one-light pendant from the Everly collection is inspired by a decorative blown glass container. This generous, bowed clear glass fixture features an Olde Bronze finish and looks distinctive with the optional Vintage Squirrel Cage Filament bulb that leaves an impact. For ease of use, the pendant's glass shell is removable for cleaning and replacement. A soft teardrop-shaped cage surrounds a cylindrical glass shade giving this three-light pendant in Olde Bronze from the Fiona collection a transitional, warm and casual feel. The oversize island pendant light adds a unique twist. This one-light pendant from the Tallie collection features a light umber translucent organza shade that's beautifully accented by a satin etched white glass lamp. The soft light creates a calming atmosphere while the double layers adds interest. 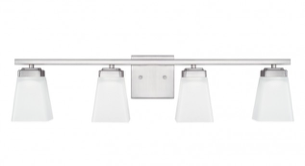 The simple, clean lined horizontal rod supports beautiful tapered soft white shades that provide soft light at vanities. The soft white glass shade that can be installed up or down, have clean lines and simple geometry to accent a space. This small pendant makes a big statement above the free standing tub in the master bedroom by adding a sparkle with the clear crystal drops and antique glass. It's soft, elegant and adds a luxurious sparkle. This traditional, understated 5 bladed 60 inch Trevor Ceiling Fan will effortlessly blend with the décor in your home. Featuring a Brushed Stainless Steel finish, this design will add a subtle touch of elegance. This old bronze sconce features beautiful seeded glass and bronze frame for an elegant transitional style. 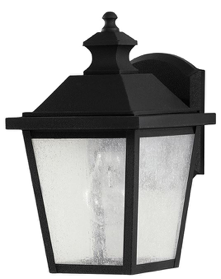 This exterior lantern with contemporary lines and symmetry has elegant frosted glass for soft output of light paired with old bronze. The simple yet substantial rustic lantern lights of the Woodside Hills lighting collection compliment virtually every style home. The Seeded glass creates a gentle, clean welcoming light.